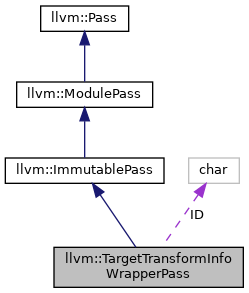 This pass can be constructed from a TTI object which it stores internally and is queried by passes. Definition at line 1730 of file TargetTransformInfo.h. We must provide a default constructor for the pass but it should never be used. Use the constructor below or call one of the creation routines. 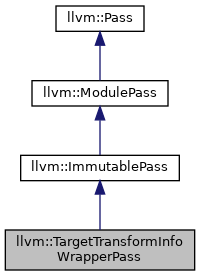 Definition at line 1212 of file TargetTransformInfo.cpp. Definition at line 1218 of file TargetTransformInfo.cpp. Definition at line 1225 of file TargetTransformInfo.cpp. Definition at line 1737 of file TargetTransformInfo.h.